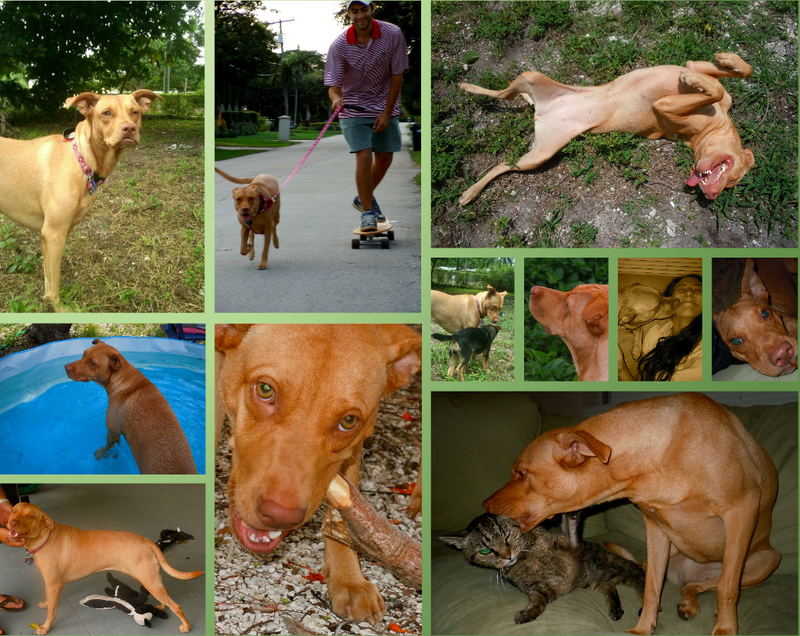 Rescued From: Miami-Dade Animal Services in March 2011. Favorite Activities Now: Playing with little sis, Chelsea; jogging beside dad’s skateboard and snuggling. 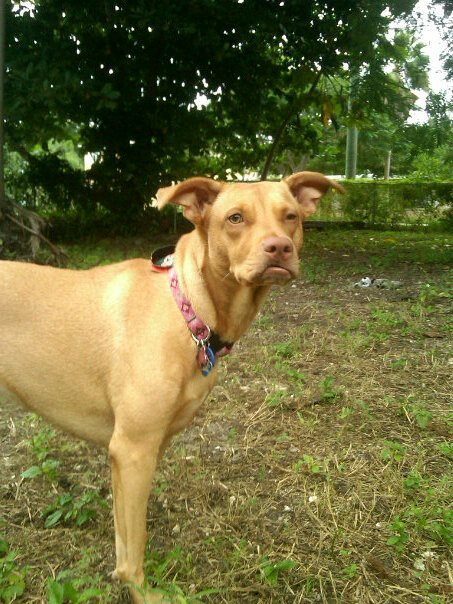 Scarlett was rescued from Miami-Dade Animal Services during a major Distemper outbreak. They asked people to come adopt dogs or they would have to be put to sleep so they could clear and disinfect the shelter. Even though the dogs could be infected we knew we had to help out. We went to the shelter to rescue one of the extremely high-risk dogs. When my boyfriend and I arrived at MDAS, I was overwhelmed. We turned on the single-lane access road and cars lined both sides. The parking lot was overflowing. We pulled up to a man standing by the fence of the shelter. He asked if we knew what was going on. We said yes and as he handed us a Distemper warning flier, he pointed us further up the road to some roadside parking. When we walked inside, it was complete chaos. Hundreds of people were in the main room. There was a take-a-number station. That should have been my hint to take one but I didn’t, instead pushing my way to the back, down the winding hallways to the dogs. People were everywhere, groups of people in front of every cage, in every room. Some were frantically scribbling pet ID numbers down and running off. I asked one guy what he was doing. He said he’d been there for 5 hours because every time he found a dog he wanted, it was gone by the time his number was called. Realizing it was impossible to interact with these dogs for more than a few minutes, we focused on a few and finally zeroed in on Ruby. She wanted nothing to do with the hoards of people and was in bad condition. Her sheet pinned to the cage had few details: owner surrender, 10 months, 28 pounds. Every bone in her body was visible and though she was fearful, she let me pet her, eventually licking my hand jammed through the chain link fence. An employee who took notice informed us Ruby was just seized from her owner and that some terrible things had happened to her. She said Ruby had only been at the shelter three days and though she was severely neglected and abused, she was still so sweet. We scribbled down Ruby’s ID number and took off to the front. Left: 3/23/11, 28 lbs. Right: 7/28/11, 47 pounds! We grabbed a ticket: #79, looked up and saw #51 was being served. Not bad, we thought, especially after seeing people running back and forth so frantically. We started talking to 2 of around 200 people in the room and they asked us our number. We proudly showed them. “No, you have G-79, see? They’re on E-51 they just don’t have the letters up there.” UGH! While we were waiting, we went back to visit her and ran into the same employee we talked to before. She asked if we were going to adopt Ruby and we said we wanted to but knew she’d probably be gone by the time our number was called. We were bummed. We wandered for another hour, going back every 10 minutes to see if Ruby was still there. While watching the entire kennel clear out we asked if these were the last dogs. They said there were two more kennels full. After half an hour of spreading this news to our new friends, we had a guided tour through the back. There were at least 250. Again, I thought there was no way they’d all be saved. 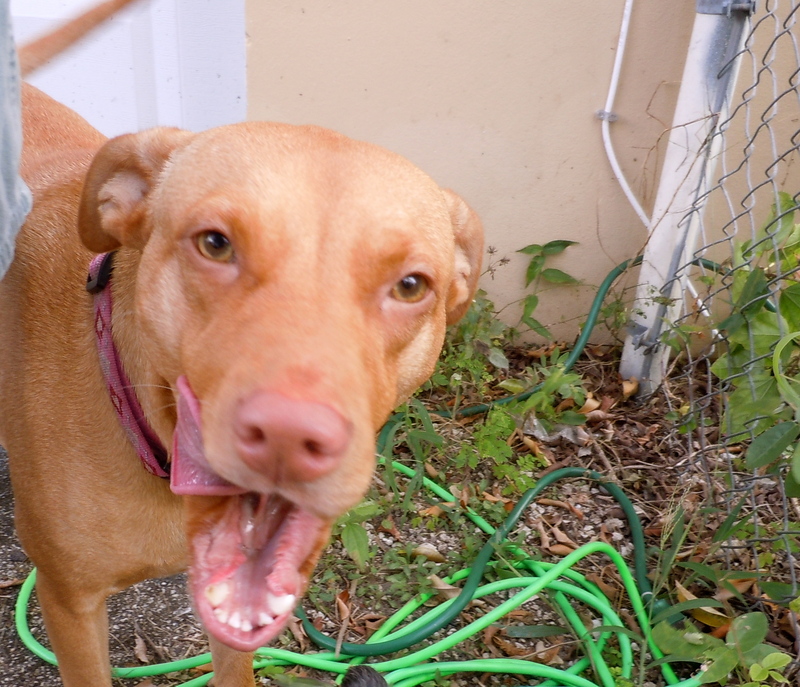 We found a few more we liked and wrote down their IDs as backup but we were already completely attached to Ruby. We paced back and forth for hours, from the lobby, to Ruby’s cage- back an forth. Miraculously, she was still there each time we went back. Though it seemed impossible we would get her, 8 long hours after we walked in, we (carried) Ruby out! Of course, this was only the beginning. 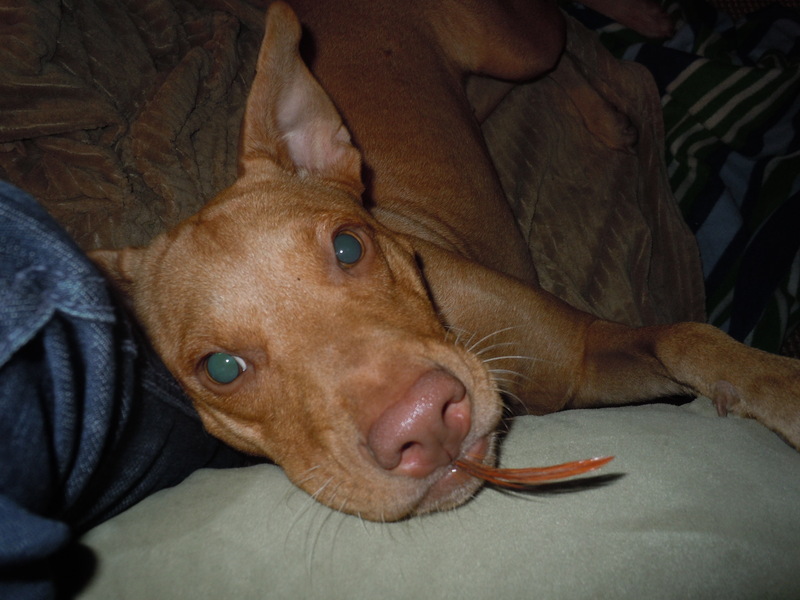 Scarlett the rescue Vizsla Mix. Scarlett was severely neglected and abused and actually tested positive for Distemper. Thankfully, symptoms never started and she survived the disease (only 20% of puppies infected overcome it). The past abuse and neglect came with physical evidence: she was severely underweight, had missing teeth, a few canines were grinded down, open wounds on her paws, “armpits”, head and body and scars all over. This is how “Ruby” came to be Scarlett. Her emotional scars were much worse. She was terrified of any person, besides myself. It took a week for her to warm up to my boyfriend. There were other things that terrified her: cars, loud noises, men, yelling, snapping, making a kissing noise and a lot of other stuff. It was so sad. Her ears and tail were down the first two weeks she was with us; we didn’t know they actually went up. But sure enough as she got comfortable, up they went She got considerably better as time went on and she learned we were not going to hurt her. And oh yeah, she’s 50 pounds now! Besides being terrified, she was very animal-aggressive. Although it wasn’t that way in the shelter, in a home environment, that changed in an instant. She became totally fear-aggressive with dogs. Despite being properly introduced to Harley and getting along for the first few hours, she snapped when he ran over to me in the yard. She rushed him, bit his neck and held him, pinned. Off to the hospital we went, and a few stitches later, Harley was better. This terrible event put everyone on edge: “give her back”, “have her put down”, “give up on her”, “she will never learn”. We felt awful for Harley because honestly, the fight was my fault but we also knew we would not give up on Scarlett. 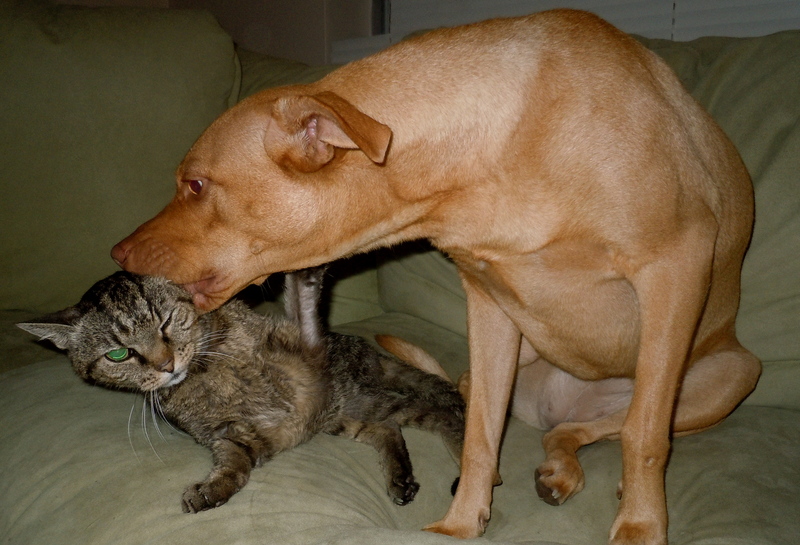 We vowed to do whatever it took to rehabilitate Scarlett and keep our home safe for Harley and our kitty, Roory. It was five and a half months of very intensive training but eventually Scarlett adjusted to life in our home. Though we still work on training every day, Scarlett is now the most gentle, well-trained girl of the bunch. Besides loving Harley, Roory and Chelsea, she loves all dogs now. 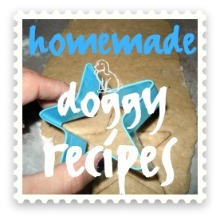 She would actually feed one of our foster puppies, Bethany, like a bird– by mouth! She showed me that a dog is truly a reflection of his or her environment. I am so happy that today, Scarlett is a beautiful dog inside and out.